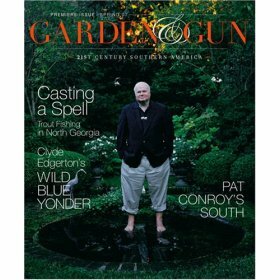 There is a new magazine out there, Garden and Gun. It sounds like an ideal sort of�Maggie's Farm magazine (h/t, Dr. Helen). With a photo of Pat Conroy on the cover, how bad could it be? I'll give it a try, if only to find out whether it's�more interesting�than�our Maggie's Farm blog. I am certain that it is better-written. Re gun mags, I used to subscribe�to Shooting Sportsman, but it has become too snooty for my taste. Informative, though, if you�own $60,000 shotguns instead of Mossbergs and Brownings like regular folks. $15 to have that sitting on my coffee table when my uber-liberal sister from Cohasset stops by? Perfect! I love to drive my commie-fascist siblings nuts by making sure I am in the middle of cleaning a gun when they stop by. Let us know how you like it. The concept is brilliant. Yes, Shooting Sportsman and even worse, Double Gun Journal, have always been snooty. There is no snobbery like shotgun snobbery. I'm curious about Garden and Gun, though. No one with a choice would use a double gun for ducks and geese. You need that third shot to say "F- you" to them as they fly out of range. Is it true that you are required contractually to drive a 1937 Lagonda to the pheasant fields whenever you bring your Holland & Holland? My slick magazine venture, "Hog Pens and Galoshes", for some reason never really caught the public imagination.